Fifteen year old Clary Fray is aghast when she witnesses the murder of a boy at a club. No one else witnessed the murder and the body of the boy vanishes into thin air. A short time later, Clary again sees one of the murderers. The murderer explains that he is a demon hunter, and the boy he killed was actually a demon in human form. The demon hunter, whose name is Jace, informs Clary that she is not a “mundane” because she has the ability to see him. Meanwhile, Clary’s mother frantically tries to call her. At first Clary ignores the calls, and when she finally answers, she is commanded not to come home. In a panic, Clary returns home to find her mother missing and her home in disarray. She is attacked by a beast and rescued by Jace who takes her to the “institute.” There Clary discovers the truth about her identity, and her true parentage. In order to save her mother, she must embrace an entirely new world and dive headlong into danger. Clare is a popular author among teens, so I thought it necessary to review a couple of her books. Her first published book, City of Bones, is part of a series that follows the adventures of a band Shadowhunters and their friends. Although I did not care for the main character, Clary, I was nevertheless impressed by the intricacies of the world Clare created. She is very descriptive and detailed, and it is not hard to be drawn into the magical world that parallels our own. Also admirable is Clare’s inclusion of strong LGBTQ characters. 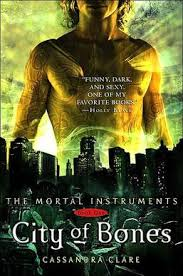 One of the Shadowhunters, Alec, is gay; though he has not yet revealed his sexual identity to his friends and most of his family for fear of rejection. The character of Magnus Bane is openly bisexual, a rarity in teen literature. This proves that a book can feature positive depictions of LGBTQ characters and still top bestseller lists. Reader’s Annotation: Clary’s whole life is turned upside when her mother disappears and she discovers her whole life has been saturated with lies. She must find the truth about her heritage if she is to save her mother and embrace the life she was meant for. Cassandra Clare, best known for The Mortal Instruments series and The Infernal Devices series, has lived all over the world. Born in Iran to American parents, she has traveled the world and lived in countries such as France, England, and Switzerland. She currently lives in the United States, and is a full time fantasy fiction writer. Her first published book was, City of Bones, part of The Mortal Instruments series, in 2007. It was adapted into a movie in 2013 and the series will be adapted into a television series that is set to air in 2016. Describe Clary witnessing the “murder” of the teen boy at the club. Describe the wild party hosted by Magnus Bane. Justification of Selection: This book is a unique take on paranormal romance, a widely popular genre among teens, especially girls. This book is a long running best seller for teen readers. It is a must have for a teen collection.